Porsche had to build the 912 between 1965 and 69 to have something in its lineup for buyers who were used to a bargain basement 356 and just couldn't afford a 911. Today, its rarity makes it a collector car. The 912 also handled better than the early short wheelbase 911s thanks to having less weight at the rear. Still, with the carbureted 1.6 producing just 90 horsepower and the fuel injected 2.0 even less, they were literally worthless after the second hand 911s hit the market in the late sixties and early seventies. 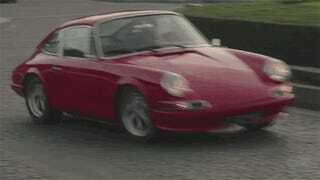 It was the Dino 308 GT4 of the Porsche universe. However, when sudden changes in life make you set new priorities in the French countryside, this playful baby Porsche, the black sheep of the family, might just be what you need to keep things rolling. By the way, when was the last time you saw a 912?